Leadership Actualization is a one on one mentoring for leaders that seek to grow and transform their leadership from within and strive for personal & professional actualization. This service is designed to help leaders make positive changes to themselves through identifying the barriers holding them back from a higher level of leadership. 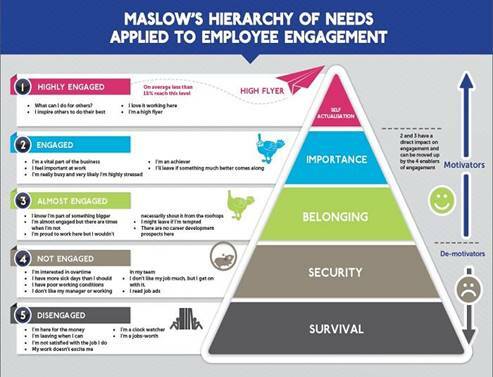 See below for Maslow’s Hierarchy of needs applied to leadership and employee engagement. Dr. Marvin Deitz has over 25 years of traditional transformation therapy that has changed his life. Dr. Deitz has taken this body of work and incorporated self-help thought leader studies, customer centricity principles, leadership best practices, 10 years of leadership mentoring and 10 years of high level teaching experience into a one on one Leadership Actualization service. He will guide clients through a transformational journey with breakthroughs that will ultimately benefit their organization. Dr. Deitz is in the process of finishing a self-help book titled Breakthrough on a Diamond where he will share his therapeutic life transformation.